In biology, we categorize life by how similar they are to each other. Like a family tree, we can see the relationship for any living organism by observing their classification of life. First, we group each species into a genus. Then, each genus has a family. After, we group genus into an order. Next, each order has a class, which is grouped into a phylum. 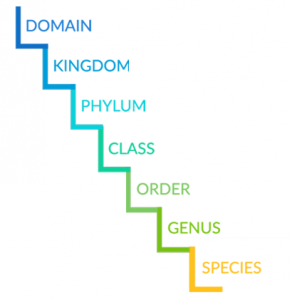 Finally, each phylum is grouped into a kingdom, which is grouped into a domain. Each level of classification answers a general question about the species. For example, domains are the top-level classification which categorizes life in the most general way. After domains, the kingdom classification gets a bit more specific. For example, is it a plant or animal? If it’s a plant, we categorize it in the plant kingdom. If it’s an animal, it’s part of the animal kingdom. As you move through the levels, the questions get more specific. “Domains” are the top-level classification which categorizes life in the most general way. It’s even more general than asking whether an organism is a plant or an animal. For example, domains separate the presence of a nucleus. While prokaryotes like archaea and bacteria don’t have one, eukarya have a nucleus. So the 3 domains of life are archaea, bacteria and eukarya. 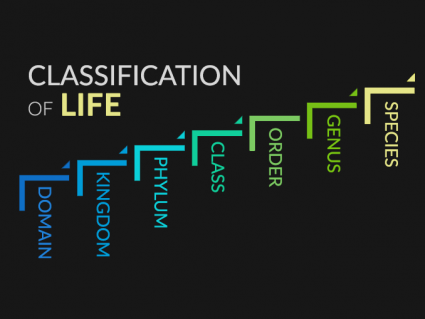 As we move down the levels of the classification of life, kingdoms are below domains. For example, protists, fungi, plants and animals are part of the eukarya domain. This is because their cells all have a nucleus. The other two kingdoms are eubacteria and archaebacteria which do not have a cell nucleus. These single-celled microorganisms evolved in the early stages of Earth’s formation and have a very different cell anatomy from eukarya.